10 medium size shrimps (sushi grade). 50gr BBQed eel (sushi grade). First thing first, mix the tempura with a little bit of water and stir until combined to a thick even mixture. Cut off shrimp tails, and dip the shrimps, one by one, in tempura mixture and deep fry for about 30 sec or until the outside gets golden-brownish. Tip – leave one shrimp for each roll with the tail uncut to place sticking out of the dragon roll rear as if it was the dragon’s tail. The roll makes a single dragon that you would then slice in to 6 pieces. I thought making dragon roll is somewhat very difficult. You simplified the process here. I would try to make it. Thanks. Wow! How to make dragon roll! This is really worth sharing. I can’t wait to start up. It amazes me that all these recipes is offered for free. I’ve learnt a lot here and I will keep learning. Thanks to the Sushi pros behind this gesture. 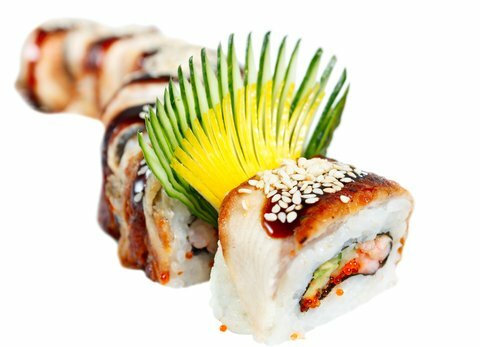 I attended a paid seminar on how to make Dragon roll sushi after which I tried twice but I couldn’t get it properly, I was searching the net to get more information and I got to this site. Everything I need, I just got it easily and this time I was successful. This is a good initiative! Thanks. I really want to make this, but I’m not sure about one thing: is a “roll” of sushi one big thing that has to be cut up into pieces, or is each of the pieces a roll?